Athens, GA (Feb 14, 2008) - Valentine's day is a day of pink and Roses. Tonight at the University of Georgia's Stegeman Coliseum, it is "Think Pink Night" for the women's basketball game between the University of Florida and the University of Georgia. Sponsored by the Women's Basketball Coaches Association (WBCA), this event is tied into Breast Cancer Awareness Month to rause money for breast cancer research. Over 900 schools are participating, as well as members of the media. Georgia is wearing pink uniforms for the game. Ann Smith, an eight year veteran of the University of Georgia Athletic Association and breast cancer survivor, was honored as honorary coach of the UGA Lady Dawgs in a pre-game ceremony. 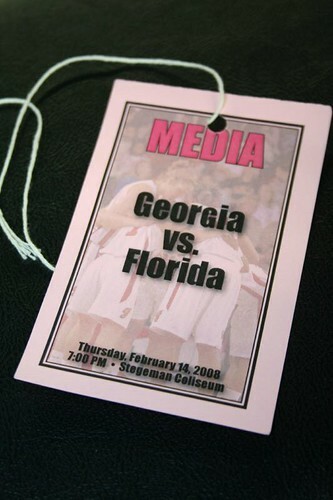 Media credential for Florida-Georgia Women's Basketball Game on Feb 14, 2008. 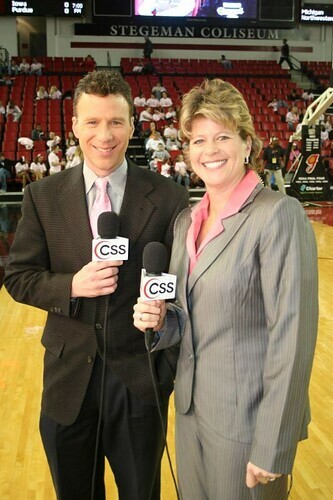 CSS/Comcast Talent Matt Stewart and Robin Muller wearing pink for the "Think Pink Night" broadcast of Florida-Georgia Women's Basketball Game on Feb 14, 2008. 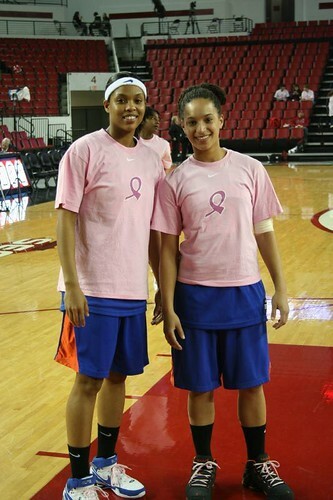 University of Florida players wearing t-shirts for warm-ups at the Florida-Georgia Women's Basketball Game on Feb 14, 2008. 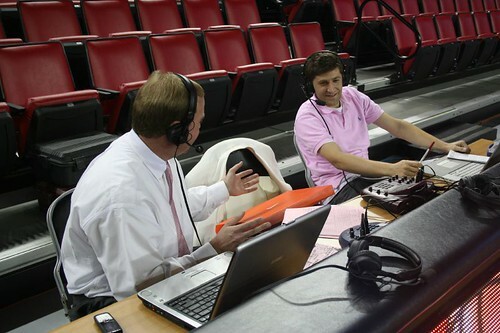 960 the Ref's Jeff Dantzler (left) and Stephen Hartzell wearing pink for their afternoon broadcast of "The Home Team" from Stegeman Coliseum on Feb 14, 2008. 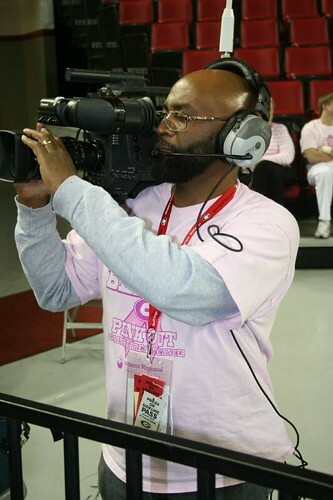 UGA videographer Ron Leverett wearing pink for the "Think Pink Night" Florida-Georgia Women's Basketball Game on Feb 14, 2008.